This is a nice and easy dessert, perfect for a festive dinner at the end of the year (or for Christmas!). You can make it a day in advance. It will taste better and have a firmer texture. You do not need to use pasteurized egg yolks as for the tiramisu because you're actually pasteurizing the fresh yolks during the au bain marie cooking phase. Use the best ingredients such as organic eggs and cream AND some real Italian amaretti (macaroons). Amaretti are much crispier - and tastier - than the Dutch version we're used to in this beautiful country - Holland, thus :) - and provide a much better result. You can find them at good Italian specialty stores and you may also want to order them online like many other Italian products. For a sweeter touch you can use sweet dessert wine instead of dry white wine. Put the egg yolks with the sugar in a heatproof bowl (preferably made of Pyrex glass). Stir and beat the eggs with the aid of an (electric) whisk until you they're light and fluffy. The mixture is supposed to become lighter in color and very creamy. Place the bowl over a pan of simmering water so that the mixture can get thicker. The bowl should not directly touch the hot water otherwise you get scrambled eggs! Stir in the wine, little by little, and keep on stirring until the mixture starts to bind. It is important that the mixture doesn't get too hot because then the proteins in the yolks would coagulate and the zabaione would no longer be creamy. When the zabaione is creamy and thicker put it aside and let it cool. Whip the cream with the vanilla sugar. Don't whip it too long otherwise the cream gets all lumpy and actually becomes butter. Add the whipped cream to the cooled zabaione and stir that in till you obtain a smooth and creamy mixture. Crumble a few amaretti in every single serving bowl to create a thin layer of crumbs. Distribute the creamy zabaione between all the bowls and store in the refrigerator until serving. Before serving, garnish each bowl with 1 cookie, a few berries and a mint leaf. 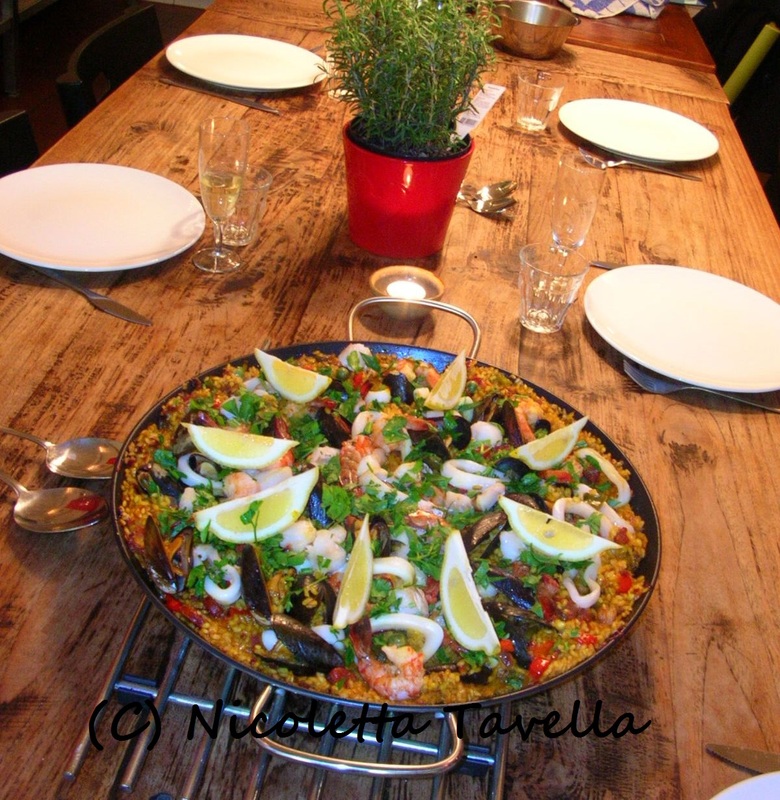 This very easy recipe, also published on my English-Italian blog, is perfect for feasting together on a Summer bank holiday like the Italian "Ferragosto" (mid-August bank holiday): it's really simple to make, fast and - bonus! - it doesn't involve any cooking. Perfect for a hot August day! To tell you the truth it doesn't even involve a lot of work from the "cook" since you will just have to prepare and chop all the ingredients, put them in nice bowls of all sizes and let your guests prepare their own wraps by stuffing some nice and crunchy iceberg lettuce leaves with just anything they like! So I'd say: put together all the ingredients you fancy the most and wrap it, baby! This is an almost-videorecipe because the video is made of photographs. It's a very quick 'n' easy dish to make, perfect and refreshing for the hot Summer days. The recipe in a simplified version is originally from Davide Varone, Claudio's brother (you can see Claudio cooking with me in the almost-video). We made it a bit more elaborated and changed the marinating procedure. The end result was really, really to our liking! The video has no subtitles, so read the recipe too to understand how to make this simple and yet wonderful dish. Remove the courgette ends. 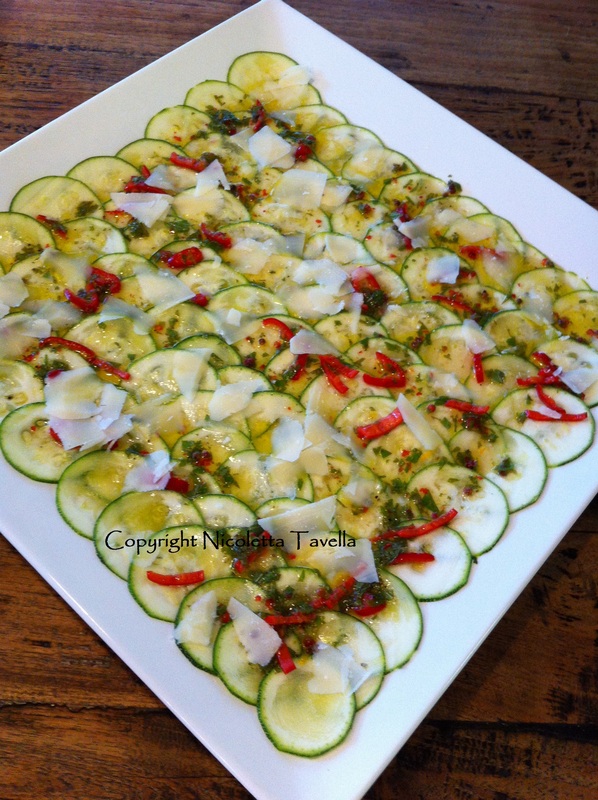 Cut the courgette in very thin round slices using a mandolin slicer (see video). If you use sall courgettes cut them in the length. Prepare the marinade mixing lemon juice, olive oil, salt and black pepper. Add the chilli pepper after removing almost all its seeds and slicing it thinly, the finely chopped mint leaves, the crushed pink peppercorns (you can crush them using your knife like I do in the video) and the lemon rind. Mix well and distribute over the zucchini slices. Leave to rest in the fridge for at least one hour and add the parmesan or grana shavings just before serving. This is a beautiful, very tasty and yet delicate specialty from my sister Francesca who loves everything that is sweet (she even has a great blog dedicated to sweets). And yet... the cake on this page was made by my Mum, Gabriella, as you can see in the video. 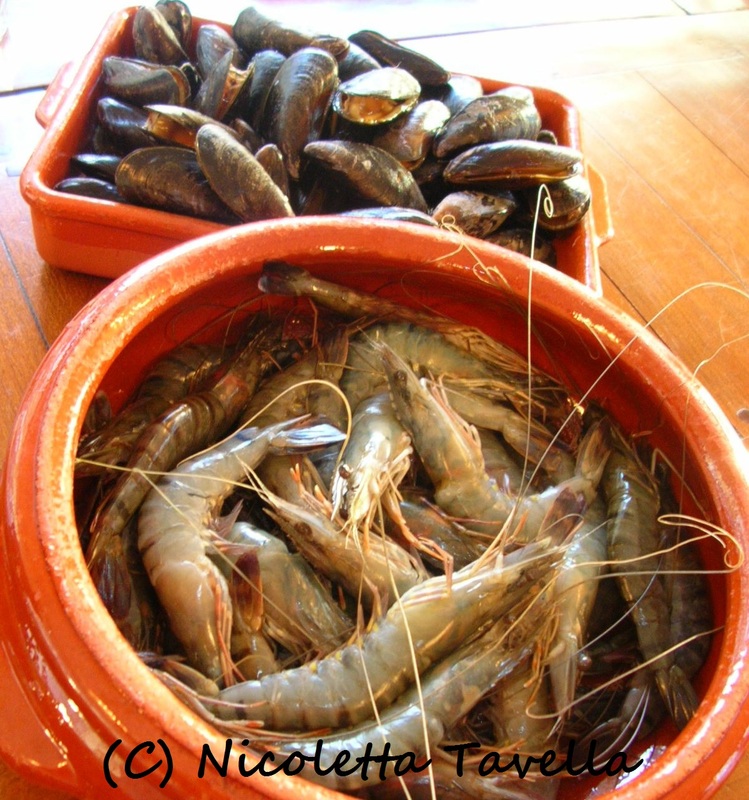 It's based on a recipe (in Italian) that Francy originally found on the Italian site Gennarino.org. It's a very simple and very attractive cake, also easy to serve because you just have to detach a single "rose" for every portion you need. Making the cake, typical from Mantua, is not that difficult (you can see how it's done in the video). The final result is quite spectacular and really, really good. Torta delle rose/Roses cake from Nicoletta Tavella on Vimeo. Mix all the ingredients well, by hand or with a mixer, and leave the dough to rest in a bowl for one and a half hour, covered with a clean kitchen cloth and away from draught. 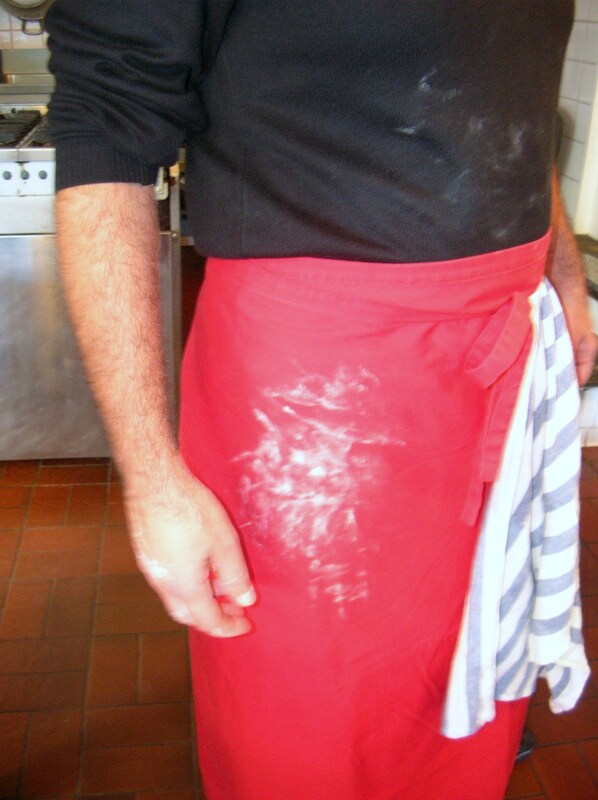 Roll out the dough with the rolling pin on a surface that you have first dusted with flour to avoid sticking. The sheet has to be not too thin neither too thick, and rectangular in shape. Mix butter and sugar and spread this cream evenly on the rolled out dough. Roll up the dough like a cigar and cut it in thick slices (see pictures). Lay the dough cylinders next to each other in a high, round oven dish (about 26/28 cm diameter) leaving some space between them because they'll rise and become larger, filling all the gaps. Leave to rise again protecting from draught until the dough has doubled its volume. If you used a spring-release tin lay it on top of a flat oven dish because the butter will melt and leak a bit. Put in the pre-heated oven (170°C) for about 45 minutes (30 with a ventilated oven) or until nice and golden (I usually ignore the time indicated in recipes because all ovens are different and check from time to time how things are going). Remove from the tin after it's cooled off a bit and serve dusted with icing sugar. For the Italian culinary blog Spigoloso I put my friend from the whole world in front of the camera to prepare some of their favourite recipes. One of the many beautiful things about Amsterdam is that you easily make friends with people who have the most different backgrounds and from all countries. My friends all love good food and many of them can also cook pretty well, sometimes professionally and sometimes not. The results are always excellent and that's why I decided to share their cooking talents on video. Take for example Pascal Plissonneau, the first to appear on Spigoloso with his famous Tarte Tatin. 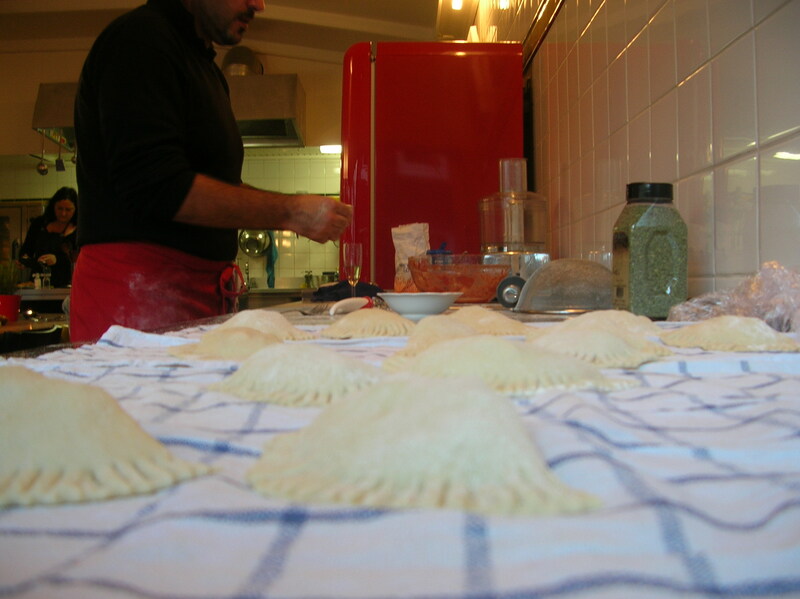 Here you can see him making it just like that, with ease and French souplesse (he's made hundreds of them!). Pascal was born and raised in Nantes, lived in Paris for a long time and now resides in Amsterdam since an even longer time. He's a translator and loves to cook. 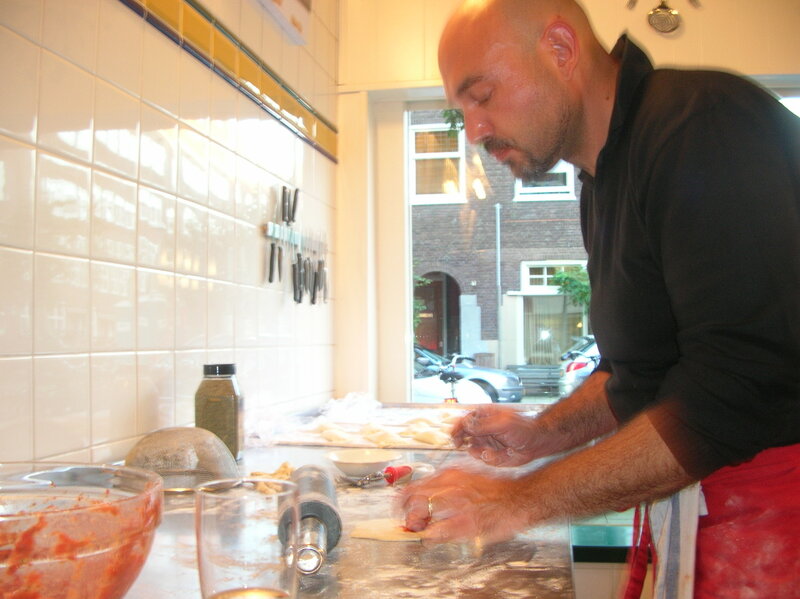 As a hobby he's even been working at one of Amsterdam's finest bakeries, the Gebroeders Niemeijer. Some of his other specialties are the crumble, the mousse au chocolat and his fantastic Thai curries. 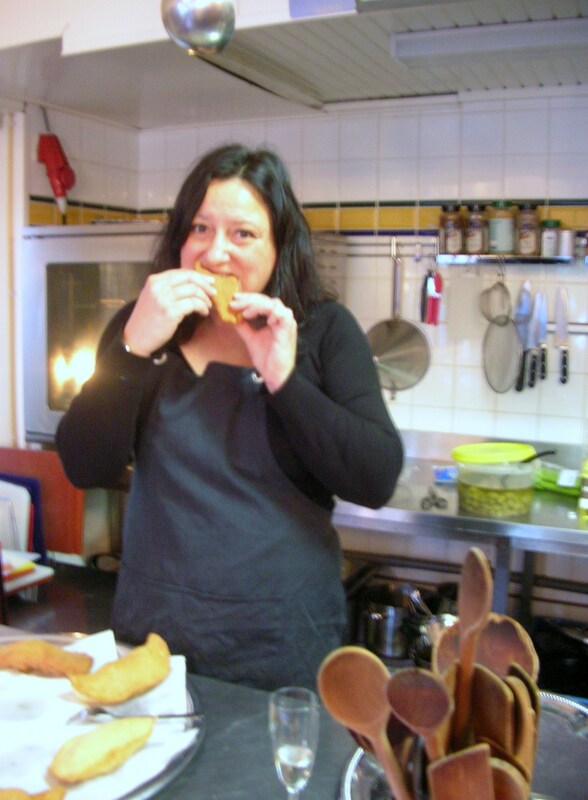 Tarte Tatin (ENGLISH VERSION) from Nicoletta Tavella on Vimeo. - Don't kneed the dough too long or it will get hard instead of crunchy once baked. - Always keep a couple of extra apples handy to make sure you have enough to cover the oven dish. - Use a high oven dish (5 cm high and 25 cm diameter) that can be put directly on the flame. - Pay attention: the caramel gets incredibly hot so never touch it with your hands when still liquid! - Always keep an eye on the caramel because it can burn very fast. Keep the peeled and cored apple quarters close to it so that you can use them immediately to stop the caramel's browning process if this goes too fast. - When the caramel starts to get golden brown move the oven dish carefully a couple of times to make sure that the sugar caramelizes evenly and to avoid burning it. If the caramel is too dark it will be bitter. - If you prefer apples that are very well coked and soft you can bake them in the oven for about half an hour at 200°C. Lay them in the oven dish together with the caramel. 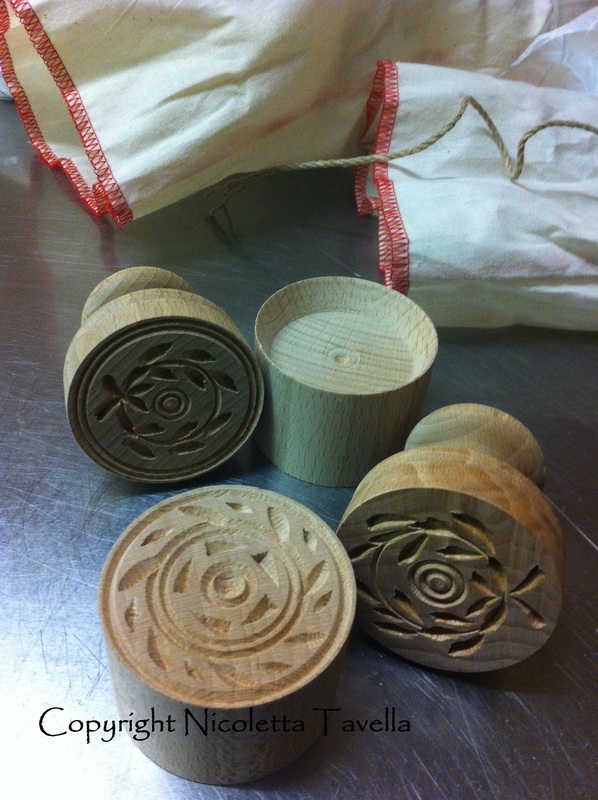 - The rolled out dough has to be quite thick (about 5 mm) and with a broader diameter than that of the oven dish. - Don't forget to dust the rolled out dough with some flour to avoid sticking during folding. - The tarte Tatin goes in the oven at 200°C for about 45 minutes. The actual baking time depends on the oven you use. Check from time to time to make sure the pastry doesn't burn or get too dark. - It's possible that the caramel flows out of the dish while in the oven. Use a flat tray or dish under the one containing the tarte Tatin to protect the bottom of your oven. - Once the tarte Tatin is ready, let is rest for 20 – 30 minutes. - Use oven gloves to flip the dessert onto a plate. The caramel can still be very hot and the gloves will also protect you from the steam that comes out of the dish while turning the tarte Tatin onto the plate. - Pascal advises to eat the tarte Tatin lukewarm together with some vanilla ice-cream or a bit of quark or crème fraîche, both with no sugar since the tarte is already quite sweet.